Gensan Celebrates the Revolution of Social Media. June 30, 2014, General Santos City. While the rest of the globe is happily celebrating the 5th Mashable's Social Media Day today, the SoxBloggers, together with GBG General Santos has successfully led the second run of the Social Media Day meetup in the Tuna Capital of the Philippines last June 28, 2014 at Shakey's Pizza Parlor in SMGS. Limited slots were opened to netizens to celebrate this global initiative of recognizing the revolution of social and digital media happening (and happening fast) before our eyes. 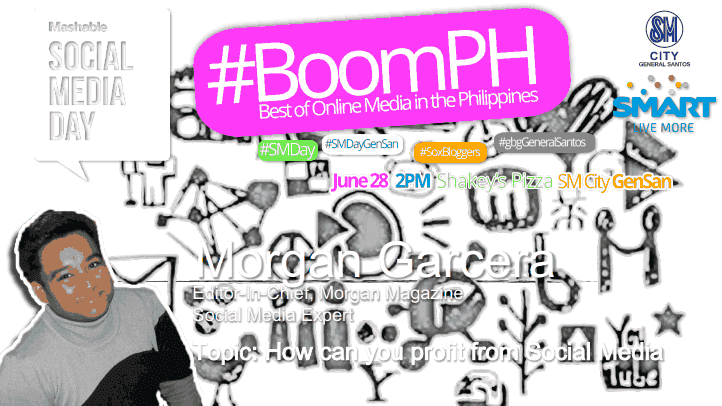 Showcasing #BoomPH or Best of Online Media in the Philippines, SMDayGensan featured four of our biggest pride who has made waves in surfing the world of social media. Our pilot speaker for the day is a Web Designer and Developer at Diverse Hue. Also a banker by profession, Alexis Canizar Chua, talked about the trends of social media and discussed why being online matters. Morgan Garcera, Editor of the Morgan Magazine , former Supervisor and Managing Partner of the Professional Plans , and who used to work for JP Morgan Chase Bank as part of their Senior Risk Management and Fraud Department, wowed the participants and literally left their jaws hanging with the all $$$ he is making on the Social Media. Morgan Talked about how to make profit online while sipping your favorite coffee at the comfort of a posh coffee shop at the same time. Morgan is not very influential online.Look at this Stat! Who else can best talk about Branding and Social Media but the man behind the successful annual beach party in Mindanao ( better known as Sarbay Festival in Sarangani Province) himself? Our third man, Ralph Oliver Layco shared his philosophy in branding: "Listen attentively, Include your audience, Blow their mind, and lead the way." 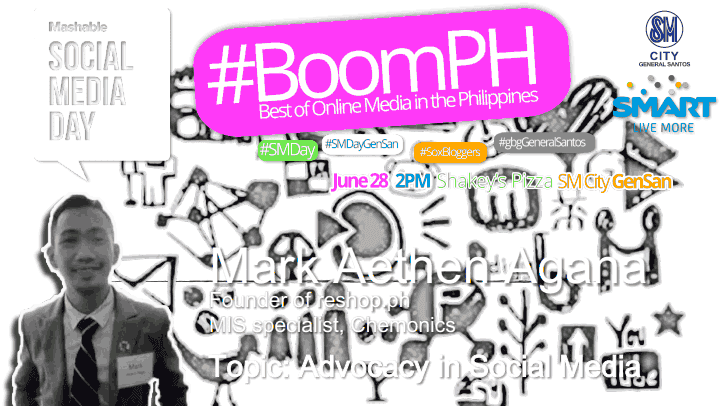 Our BIG man,Mark Aethen Agana,MIS Specialist at Chemonics and founder of Reshop.ph, an online platform whose goal is to help people live more sustainably by increasing awareness and how one can be a part of the solution than be a part of the problem,discussed how one can utilize Social Media to promote advocacy. Indeed,the revolution of Social and Digital Media is something to celebrate about. These platforms had enriched our world and had made it possible for us to reach the corners of the continents at the tap of our fingertips. Social Media is here to stay and it can only get better.